Earlier this year I enjoyed watching a series on BBC4 about Flemish painting written and presented by Andrew Graham-Dixon. One of the paintings featured was the Arnolfini portrait by Jan van Eyck, one of the most recognisable pictures in the world, and a firm favourite of mine. 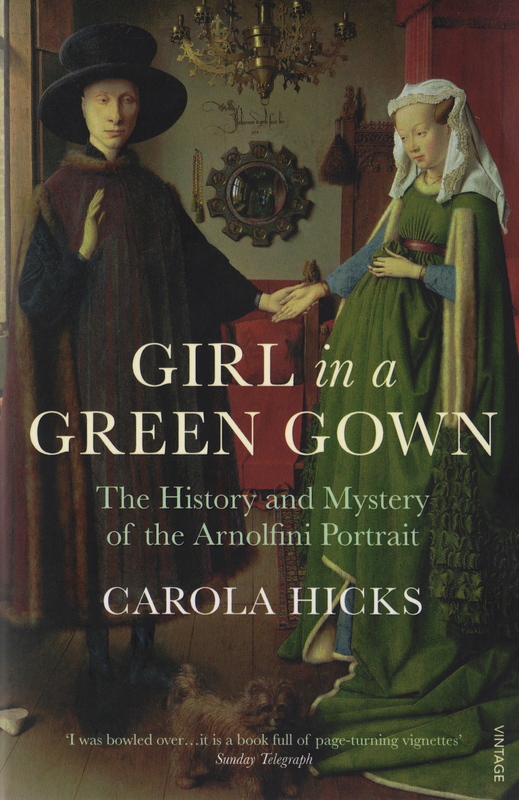 A few days later I happened to be in King’s Cross station and spotted Carola Hicks’ Girl in a Green Gown: the history and mystery of the Arnolfini portrait and just had to buy it. What I hadn’t realised is that, unusually for a painting this old, its provenance can be tracked from the date it was painted right up until it became part of the collection in the National Gallery in the 1840s. What makes this book so fascinating is that it alternates the stories of the various owners (including one of my favourite historical figures, Philip II of Spain) with various detailed aspects of the picture itself – the mirror, the clothes, the chandelier, the dog etc. – explaining both the symbolism and the technical skills involved. There is heaps of information in this book but it’s presented in a light and engaging way which certainly held my interest and had me looking up further information elsewhere. there is also a fascinating chapter on how perceptions of the picture have changed over time and how it has ben adopted and adapted for satirical and advertising purposes among others. Sadly, Carola Hicks died from complications relating to cancer before she had put the finishing touches to the book, but her notes and amendments were incorporated by her husband so that her work could be published. I’m so glad he was able to do so because this is just a delight and if you are at all interested in art you should seek this one out. About time for another National Gallery visit I think! This sounds really interesting. It puts me in mind of a work of fiction that is actually based around an old picture – trying to remember the name of the book. Was based in Tudor times?? Nope, can’t remember so I’ll have to go and look up – it was obviously made up but it was still good. It’s fascinating, and I felt I learned a lot. One of those books you want to read bits of to other people in a really annoying way! And when you come over we shall meet up and go somewhere for tea and cake!